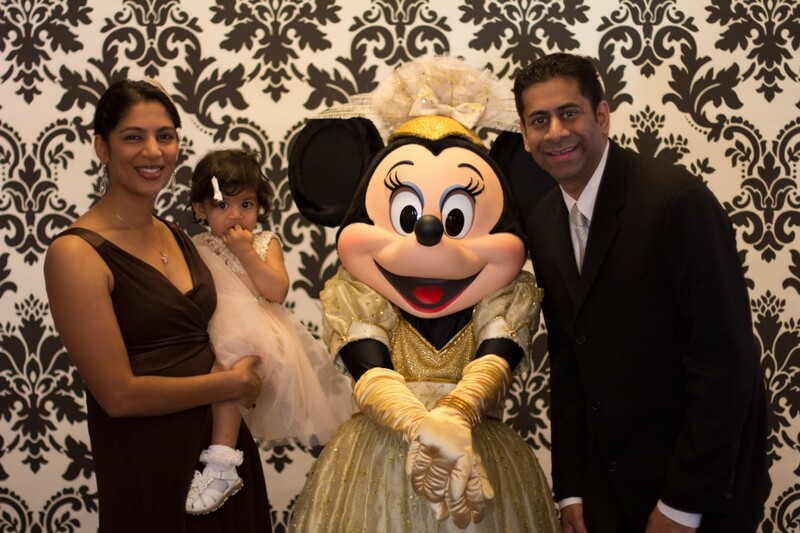 Our Family Vacation on the Disney Wonder – Part II: The Food! Like on all cruises, there was a heckuva lotta eatin’ going on. Primarily by me. Actually, I was trying to behave but despite my efforts, I still came back a little heavier than I left. Anyhoo, let me tell you about the food situation on the Disney Wonder cruise ship. There were three main sit-down dining halls and each night, you are assigned one dining hall to attend at a set time. One was called Triton (named after Ariel’s father from The Little Mermaid), a second called Parrot Cay, and a third called The Animator’s Palette. Triton was the classiest with subtle colors and some sealife decor, Parrot Cay was a little more tropical with bird decorations and bright colors, and The Animator’s Palette was super fun with black and white domino design tables and chairs, checkered floors, paintings that changed from black and white to color, and paint brush wall accents that also changed colors. Each night came with a different theme and you could pick from a number of appetizers, main courses, desserts, etc. Our waiters were charged with serving 24 of us. There was an assistant waiter (Jude from India) who was responsible for taking drink orders and bringing drinks, cleaning up the table and assisting the main waiter (Chat Chai from China). It could not have been easy serving us but they did it. All in all, the service was ok but the meals just seemed to drag on forever, partly because they’re course after course and partly because our guys couldn’t go any faster than they were. The hard part is that with eight kids under the age of six, someone was always taking a little one out to walk around. It was hard to enjoy a meal in peace. But that’s to be expected. I have to say that Jude was excellent with Miss K’s milk. We noted on our cruise reservation that Miss K. had a milk allergy and he had a warm glass of soy milk ready for her at every meal. Just the right temperature. Because the meals took so long to come out, though, Miss K often filled herself on bread (we had to give her something to keep her busy!). Disney was excellent with making sure that Miss K didn’t have dairy since we noted it. Once at breakfast I had ordered an omlet with cheese and they checked three times with me to make sure it was ok for her eat. Crazy. Our friends also have a daughter who is lactose intolerant and the day care folks called them to make sure it was ok to have a cookie since there’s butter in it! Our friends were interested in eating Indian food instead of the normal menu and the head waiter accommodated that. Although the descriptions sounded excellent, I didn’t care for much of the food that was on the normal menu. I’d say the indian food was better! But this is typical for cruises. The food is usually upscale in nature and in appearance but I just don’t think they can make it taste fantastic when they’re having to make so much food. Anyway, the ship also had a couple buffets that were convenient for lunch or breakfast. They weren’t as good as the ones we had on the Celebrity cruiseline, but they were fine. The ship also had three quick-serve food joints near the pools – Pinocchio’s Pizza, Pluto’s something or other that served hot dogs, burgers, and fries, and Goofy’s something or other that served salads, sandwiches, fruit and healthier options. Those places came in handy too. One thing that was different on this cruise versus others is that the soda was included in the price of the cruise. I think we only got Sprite once but considering other lines charge extra, thought that was nice. The ship also had a fine dining restaurant on board called Palo. It was an Italian restaurant and if you’re interested in eating there, you pay an extra $20 per person. The food was definitely worth more than $20 per person. I really enjoyed our meal. I had a steak for dinner that was cooked perfectly, and I think polenta for an appetizer and then for dessert, the waiter brought out eight desserts for four us! He was gung-ho on the chocolate souffle, which I thought was good – I just don’t love it. But he insisted that we all get it. In addition, he brought out a fancy shmancy tiramisu (which was ok), a DELICIOUS panna cotta, and two other desserts that were quite good. I really liked it. Our sister-in-law and her husband were gracious enough to watch the baby while we ate and then we watched their dumpling when they went. What else? Oh! There’s also 24 hour room service. We ordered sandwiches once and then got milk and some bread and fruit for Karina in the morning. I’m telling you – there’s a lot of food! Oh ya, each night at dinner, the kids also feasted on mickey mouse ice cream bars. I have to say they were pretty rich – definitely not the chintzy ice cream bars we used to get at school! I think the worst part about the food was that while on the boat, Miss K. got diarrhea. It started the second to last day on the ship. We don’t know if it was from food she had on the boat or if it was the food she had while we were on land or if it was something she put in her mouth that she shouldn’t have. All we know is that she had diarrhea for over a week so we had her stool tested. Four days later we found out that the poor baby had Shiga toxins caused by e. coli. Her stomach had been cramping and we didn’t even know it. Sure, she was cranky but she was also fighting a cold/flu. She was miserable. Luckily she seems to be much better now and no medication was in order. It was just something she had to work through her system. I don’t understand it though. I ate pretty much everything she ate – she basically ate from my plate the entire trip. I didn’t get sick but she did. Anyway, I can’t blame the food on the ship necessarily but it may have been a cause. A couple weeks ago, our family went on a cruise to Mexico upon the Disney Wonder and we had a fantastic time! The cruise left on Sunday from Los Angeles and was seven days long. We went with several of our friends – there were a total of 24 of us (including eight kiddos)! It was a blast; our rooms were all lined up in a row so there was always someon we were getting together with or running into. 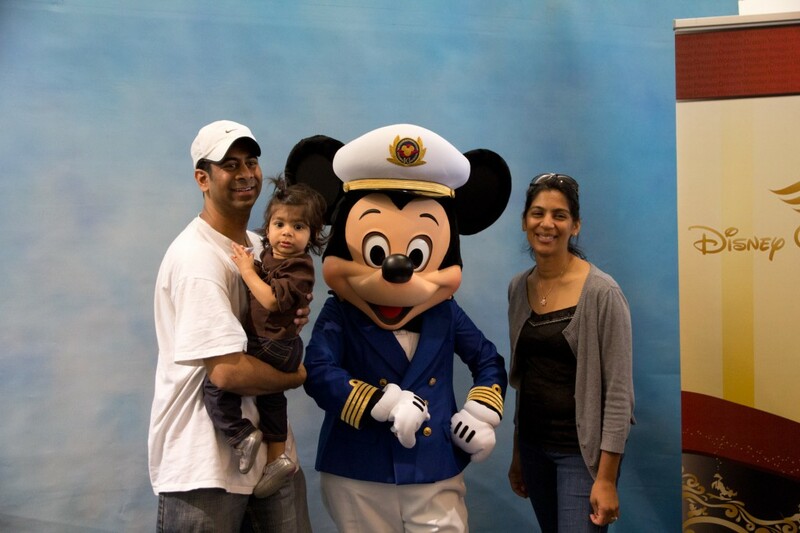 Mickey Mouse is quite the celebrity. It was cool how you could actually get your pictures taken with the Disney icons, in comparison to what happens when you go to the park. Because they’re so loved, they get mobbed at the park but on the ship, there are only a couple thousand people. We were able to see/meet Mickey, Minnie, Donald, Daisy (Karina danced with her! ), Pluto, Goofy, Belle, and Snow White. We also saw (from a distance) Peter Pan, Chip and Dale, and Tiana. It was nice! The trip started out with two sea days, including the formal night. We all got gussied up and had a fancy meal out. My sister-in-law and her husband graciously watched Karina while we had a nice meal at the upscale restaurant. There was a lot to do onboard – the kids areas were more extensive than we’ve seen on other ships – they had at least four kids (no parents) areas for kids of varying ages. There were also three pools and a splash area for toddlers. Karina loved the splash zone but since she’s not potty trained, she wasn’t allowed in the kids or family pools. They also had an adults only pool. The rooms themselves were fine. We liked that there was a curtain separating an area where there was a pack n play for Karina to sleep in from our bed. That allowed us to put her down for the night and shut the curtain so she didn’t see us. The other thing I liked about the room was that there was a separate toilet and shower room, each with a sink and mirror. It allowed both hubby and I to use the facilities at the same time. One of our travel companions had a horrific time with their toilet. Apparently someone somewhere in our hall had backed up the plumbing and our friends unfortunately ended up with a flooded bathroom twice. The second time they moved to another room. What a pain! I will say that I was impressed with Disney’s attention to cleanliness. Despite the number of children on the ship, I don’t recall seeing trash on the floor or even fingerprints on the windows. It was VERY clean. And our stateroom attendant did a great job. It’s easy to end up with a mess when you’re in such a small space but he kept us clean! What else? Disney is magical. Not only is their attention to detail phenomenal (even the plastic glasses had mickey symbols on them! ), but people are happy when at their venues. I saw so many children with wonderous looks in their eyes, mommas holding and hugging their babies, and Daddies proudly taking pictures of their beautiful families. It was really nice. The characters were incredibly friendly and did a great job. Snow white always stood with her hands just so and even giggled like the Snow White cartoon. Just amazing. The only service breakdown that I felt we had was the front desk/guest services staff. They weren’t rude, but they weren’t terribly helpful or friendly either. For example, my husband put in a request several weeks in advance for an extension cord. We were assured we would have one. We got to the room and it wasn’t there. So he went down to ask for one and was told “you should have requested one in advance.” Uhh…we did. And then he asked where to plug it in (we moved the bed and looked for an outlet and there wasn’t one. The response was “there’s nothing magical about this extension cord.” Otherwise the staff we encountered was great, always acknowledging our baby, trying to make her smile, and calling her princess. All in all, we liked the boat! Tomorrow I’ll talk about the food and then will follow that up with a post about the ports. Time for the third installment of Tips for Traveling with Baby, this time we’re talking about what to do when you’re on the plane. By now, you’ve packed your suitcase and your baby bag, made it through checking in and security and have even gotten your stroller’s gate check tag. Phew! You’re almost there! Time to board that plane. Once you’ve handed your boarding pass along with baby’s boarding pass to the gate agent, you’ll need to leave your stroller (if you’ve brought it with you) at the end of the jetway, folded down. Make your way to your seat and get comfortable (or as comfortable as possible). If the flight is not full, see if you can get a seat that has an empty seat next to you if you didn’t purchase a ticket for your baby. Alright, truth is I don’t have a ton of tips for the plane. So I’m gonna stop playin’ like I have a ton to say and share what little shizdom I do have. Feed the baby on the way up and especially on the way down. If you can’t or it doesn’t make sense to feed little punkin, take a pacifier with you and give it to them to help clear their ears. Otherwise poor thing will suffer. Have some easy to eat snacks ready at all times. I don’t know what kind of calming crack they put in Cheerios but they have lulled my daughter to a calm many times. Cheerios, puffs, baby mum-mums, teething biscuits, fruit…anything quick and easy. Have it. Remember that your baby comes first. Your child will cry. Or squeal in delight. Or poop and make things stinky. Other passengers may shoot you dirty looks. BUT there are also a bunch of passengers who have kids and understand and sympathize and actually find your baby adorable. The sound of your little one’s wails will seem ear shattering but really it’s probably not as loud as it seems. Take care of your child first. Worry about everyone else later. Plan on getting to the airport at least 1.5 hours before your flight departs. If you have a rental car to return, are flying on a heavy traffic day, or are flying internationally, you’ll need even more time. Traveling with a child takes more time than when you’re alone so why stress yourself out? Take a passport or your baby’s birth certificate. We had flown five round trips without anyone ever asking for our baby’s ID so on the sixth round trip, we thought we didn’t need it. Of course they asked for it. Luckily we live 15 minutes from the airport and were flying from home so my husband was able to go get it. Don’t get caught unprepared! If you are bringing your carseat with you, know whether you’re checking it in on taking it on the flight with you. If you’re planning on checking in the carseat, you’ll need something to put it in. 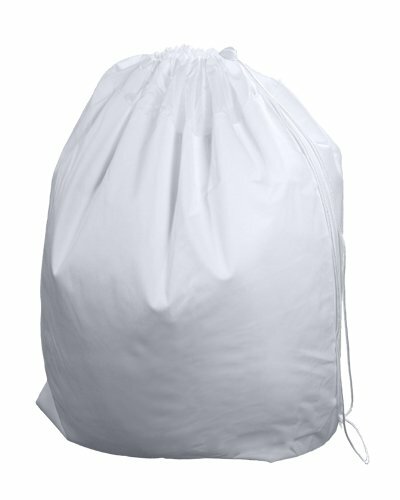 We bought a bag that’s something like this to protect it…we’ve seen others using bags provided by the airline. Call ahead if you’re going to do this to confirm the airline provides those bags. And give yourself some time to wrap up the carseat at the airport. We’ve always checked our carseat in because we didn’t want to lug it around at the airport. If your child will have his own seat, you might want to take it onboard with you. We’ve never done that though. You’ll need to hold on to your boarding pass and your baby’s boarding pass. Even if you’re traveling with your baby as a lap child, you’ll still need to make sure there’s a boarding pass for each of you. And the person whose ticket the baby is attached to will need to be the one holding the baby while boarding the plane. Know what to expect at the x-ray security area and plan out who’s doing what. If you’re traveling alone, then you’re doing everything. 🙂 If you’re traveling with a companion, decide ahead of time who will be carrying the baby through the metal detector, who will be folding up the stroller, who will be taking the bottles out of the baby bag. It just makes things less stressful when you’re actually having to do it. If you checked your stroller at the counter and are using a carrier, things may be a little easier since you don’t have to fold up the stroller. If you have your stroller, they’ll run it through the x-ray machine once you’ve folded it up. If you have filled baby bottles and/or sippy cups, the security staff will take those liquids and test them. In all our trips, we’ve come across two means to test them; either they’ll open the bottle and wave a test strip over the liquid or they’ll just lay closed bottle down sideways in a testing machine. You’ll need to accompany the security staff to get the bottle tested. And of course, you’ll still need to remove your shoes, empty your pockets, and take out any laptops. Phew! I find this to be the most stressful part of the airport experience, especially when there’s a long line of travelers ahead of you. If you didn’t check in your stroller, you’ll need to get a gate check tag from the gate counter before you board the plane. The stroller definitely comes in handy at the airport and we gate check it, which means we can use it until right before we board the plane, where we fold it up and leave it for an attendant to load on to the plane. When we de-plane, we pick it up right outside the gate of the plane. I will say that our stroller is pretty banged up from all our travel (well that and it was once used in a baby shower obstacle course game). I’ve been noticing each time we travel, it’s a little worse than it was the time before. If your baby is strong enough to sit in an umbrella stroller, those are highly recommended for travel. Plan your feedings. If you give yourself enough time, you’ll have the luxury of being able to feed your baby whenever she’s ready to be fed. We’ve stopped in an out of the way area to breastfeed our baby before going through security. It’s just less stressful that way. Some airports, like San Jose International (SJC), have rooms where you can nurse, which is really nice. Ideally timing works out to where you can feed the baby to coincide the ascent and descent of the plan. Change baby’s diaper before you get on the plane. There’s still a chance that you’ll need to change a diaper on the plane, but if you do it beforehand, it’s a lot less stressful. Pretty much all airports have changing tables in the ladies’ rooms. We’ve had to change a dirty diaper on the plane before. I just felt bad for those around us. So now you know what to expect at the airport. Good luck! So she’s spent some time in the car and some time at the airport and in a plane. 14 flights (well, technically 16 flights!) seems like a lot for a tot but we did it. We’ve learned a lot as a result so I thought I’d share some tips but there’s a lot to cover so I think I’m going to start a series of Travel Tips. Hope it’s helpful. One caveat: this is my experience with my baby that is less than one year old. Yours might have different needs and I’m sure our needs will change as she grows. First on the list, what to pack BEFORE you go on your trip. On the first overnight trip, I was a little overwhelmed. I didn’t want to forget anything. 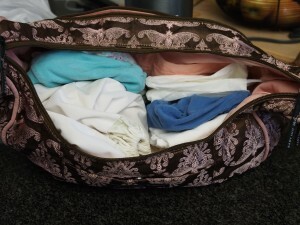 For several trips afterwards, I found that I was consistently over packing clothes and diapers. But over time I’ve learned and I think we’re getting better. Diapers: Whether you cloth diaper or use disposables, my rule of thumb is take the average number of diapers you typically use per day times the number of days you’ll be traveling plus three extra diapers. I’d take five extra if it’s a trip longer than five days. If you use disposables and are traveling on a long trip, consider purchasing the bulk of diapers at your destination so you don’t have to haul them all the way there. I’ve heard of people placing an order online and having it shipped to the hotel or condo they’re vacationing at. Wipes – take extra. They’ll come in handy for a lot more than just diaper changes. Food: If your baby is EBF, then you’re set! If she drinks formula, then take the amount of formula you’ll need plus enough formula for two extra feedings. If it’s a short trip, I don’t bother taking the full can of formula. I just scoop out the amount we need into a ziploc bag and then throw the measuring scoop into the bag. If your baby is eating solids, I try to travel with easy foods. So avocados, bananas, cereal (I usually pour the powder into a plastic container), O shaped cereals, puffs. At home I usually make my daughter’s food but on the road, I’ve bought prepared food for ease of use. I’d recommend getting the kind in pouches – their shape is flexible for easy packing and you don’t have to worry about glass jars breaking. Also, you can close up the pouch if you don’t finish the entire package. In general, err on the side of caution here. More food is better than not enough food. Food “Accessories:” I take three bottles and three spoons with me and two bowls/small tupperware containers to make food in. Of course you’ll need something to wash all that with…I like taking disposable scrub cloths with soap built in with me; they don’t take up much room and they work great. Alternatively if you have a bottle brush with a soap dispenser built in, that would be useful. Just make sure you put it in a ziploc bag before you pack it! Blankets: I take one light blanket for the plane and one heavy blanket for nighttime sleeping. If your baby co-sleeps, then maybe you don’t need a heavy blanket. Bath soap/shampoo/lotion/sunscreen/combs/hair ties: I like taking her toiletries out in smaller bottles if we’re short on space. Place for baby to sleep. We have taken a Pea Pod. We have taken a Pack n Play. We have used cribs from the hotel. She’s slept in our bed. We’ve tried a few different things. Know your baby and figure out what works for her. If you use a baby carrier (Beco, Ergo, Baby Bjorn, Moby, etc), they’re great for travel because they free up your hands to do other things. What does baby need to fall asleep? Is it music? Pacifier? Sleep sheep? If it’s a must, take it with you. We’ve been taking her glowing sea horse that plays music. It signals sleep to Miss K.
Big toys. Does your baby REALLY need the gym or swing or singing stuffed animal? If he does, then take it. If not, leave it! Baby towels. It’s only for a few days, baby will be fine without it. More than two books. Baby doesn’t mind the same book a few nights in a row. 3 – 5 diapers in addition to the one she’s wearing. Everything else goes in the suitcase.